KTM newcomer Ward tops MX2, Tierney sweeps MXD motos. 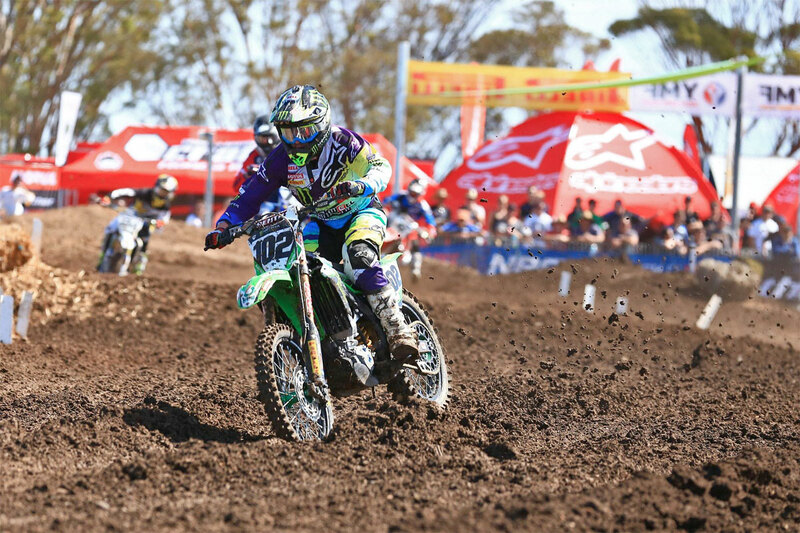 National Pump Monster Energy Kawasaki’s Matt Moss has won the opening round of the 2016 Motul MX Nationals at Horsham in Victoria. 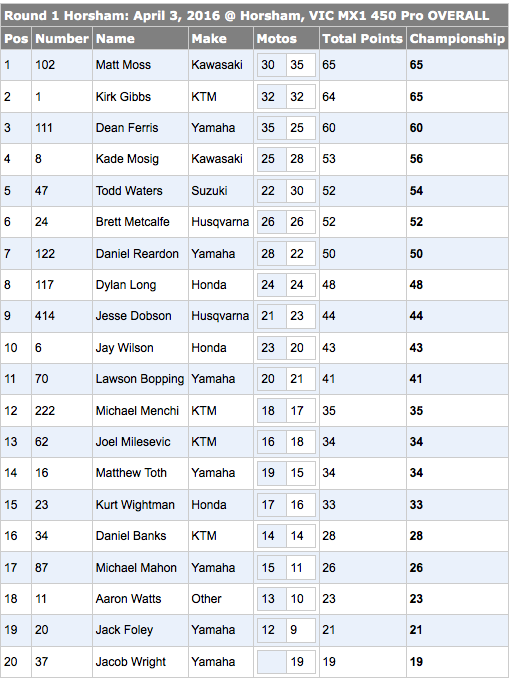 Moss was third in the opening leg won by Dean Ferris (CDR Yamaha), before he moved forward to dominate the second and clinch the overall in the process. Second on the podium behind Moss was reigning champion Kirk Gibbs (KTM Motocross Racing Team) with a 2-2 scorecard, while a fourth in moto two placed Ferris third for the round. Early moto two leader Kade Mosig (National Pump Monster Energy Kawasaki) was fourth, Todd Waters (Wilson’s Coolair Motul Suzuki) fifth despite a flat tyre in moto one. The top 10 overall featured a mixture of strong riders, as American-based Brett Metcalfe (SD3 Husqvarna) was sixth, Dan Reardon (CDR Yamaha) seventh, Dylan Long (Crankt Protein Honda Racing) eighth, Jesse Dobson (KTM Motocross Racing Team) ninth and Jay Wilson (Crankt Protein Honda Racing) 10th. In the MX2 class it was factory KTM Motocross Racing Team rider Caleb Ward who won the opening moto, but finished fifth in the second. He was joined on the podium overall by Nathan Crawford (Husqvarna) and Jake Moss (National Pump Monster Energy Kawasaki). 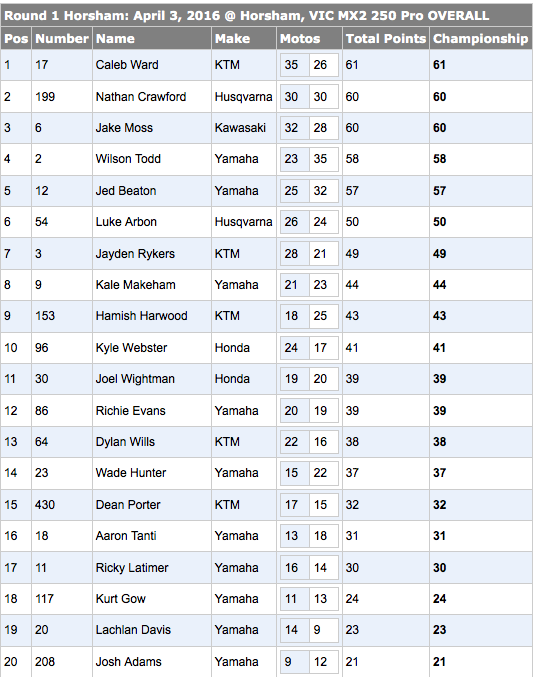 The top five for the round was completed by moto two winner and MX2 rookie Wilson Todd (Serco Yamaha), while Jed Beaton (DPH Motorsport Yamaha) was fifth,. The MXD category overall was clinched by Husqvarna-mounted rising talent Connor Tierney, winning both motos to win the round from Cooper Pozniak (KTM) and Kaleb Barham (Husqvarna). 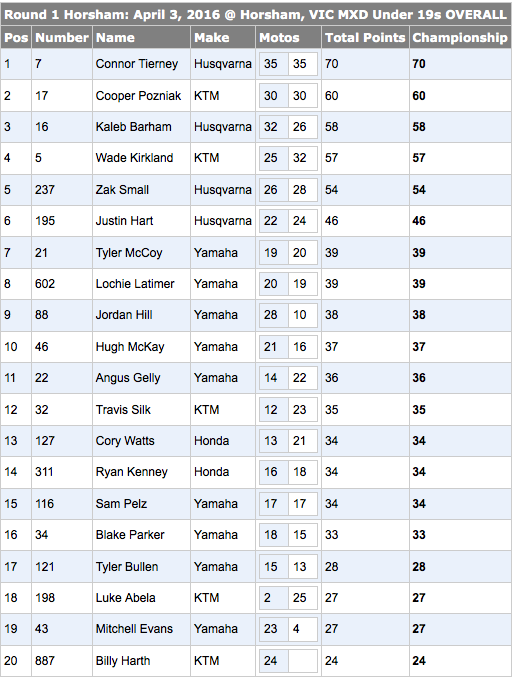 MX1, MX2 and MXD results from the opening round of the year.